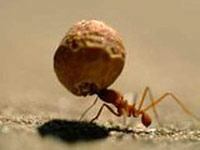 An estimated 20,000 species of ants exist in the world. They are especially prevalent in tropical forests, where they may comprise up to half of all the insects living in some locations. All ants live in colonies and have a structured social system, with different castes - worker, soldier, queen and drone - all of which carry out specific tasks for the colony. Only the queen and the males she mates with on her maiden flight will reproduce. All the workers and soldiers are sterile females. Ants have colonized almost every landmass on Earth. Ants form colonies that range in size from a few dozen predatory individuals living in small natural cavities to highly organised colonies which may occupy large territories and consist of millions of individuals. These larger colonies consist mostly of sterile wingless females forming castes of "workers", "soldiers", or other specialised groups. Nearly all ant colonies also have some fertile males called "drones" and one or more fertile females called "queens". 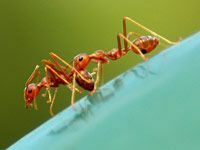 The colonies are sometimes described as superorganisms because the ants appear to operate as a unified entity, collectively working together to support the colony. Ants look much like termites, and the two are often confused. However, ants have a narrow "waist" between the abdomen and thorax, which termites do not. 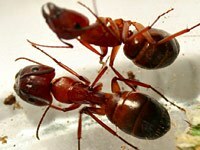 Ants also have large heads, elbowed antennae, and powerful jaws. Ants communicate and cooperate by using chemicals called pheromones that can alert others to danger or lead them to a promising food source. Like other insects, ants smell with their long and thin antennae that are fairly mobile. The antennae come in pairs, they are like binocular vision or stereophonic sound equipment. They provide information about direction as well as intensity. Since ants spend their life in contact with the ground, the soil surface makes a good place to leave a pheromone trail that can be followed by other ants. In those species which forage in groups, when a forager finds food they mark a trail on the way back to the colony, and this is followed by other ants that reinforce the trail when they head back to the colony. When the food is exhausted, no new trails are marked by returning ants and the scent slowly dissipates. This behavior helps ants adapt to changes in their environment. When an established path to a food source is blocked by a new obstacle, the foragers leave the path to explore new routes. If successful, the returning ant leaves a new trail marking the shortest route. Successful trails are followed by more ants, and each reinforces the trail with more pheromone (ants will follow the heaviest marked trails). Home is often located by remembered landmarks in the area and by the position of the sun; ants' compound eyes have specialized cells that detect polarized light, used to determine direction. They typically eat nectar, seeds, fungus, or insects. However, some species have diets that are more unusual. 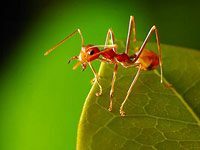 Army ants may prey on reptiles, birds, or even small mammals. One Amazon species cooperatively builds extensive traps from plant fiber. These traps have many holes and, when an insect steps on one, hundreds of ants inside use the openings to seize it with their jaws. 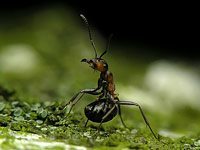 How do ants attack and defend themselves? Ants attack and defend themselves by biting and, in many species, by stinging, often injecting or spraying chemicals like formic acid. Download free Ant wallpapers, click on the image to open the large version. Print free Ant coloring pages, click on the image to open the large version.